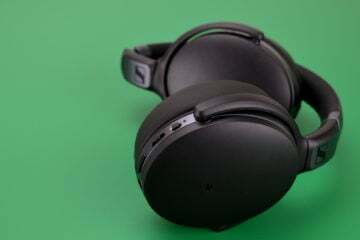 True wireless headphones are getting increasingly common, but the fact is that they’re still a new concept, and most true wireless headphones generally have something wrong with them — whether it be comfort-related, sound-related, or performance-related. Master & Dynamic, however, thinks it has cracked the true wireless code with the new Master & Dynamic MW07 headphones. Truth be told, we’ve been waiting for Master & Dynamic to enter the true wireless world. We’ve loved every Master & Dynamic product we’ve reviewed, and a premium company like Master & Dynamic launching true wireless headphones could have a significant impact on the market as a whole. But are the Master & Dynamic MW07 headphones really the true wireless headphones to beat? We put them to the test to find out. Master & Dynamic is known for its beautiful design and attention to detail, and the Master & Dynamic MW07 headphones are no exception to that rule. Everything, from the charging case, to the charging cable, to the headphones themselves, are beautiful. Let’s start with the actual earbuds. The headphones are available in a range of different colors, including “grey terrazzo,” matte black, tortoiseshell, and steel blue. They’re all very nice color options — and we’re reviewing the grey terrazzo option. Each earbud has a small rectangular cap, which faces outward, along with a single button on the right earbud, and a volume rocker on the left one. With those two controls, you can control playback and volume, which is a nice touch. The earbuds also have a indicator light, which is used to determine their status. They also come pre-installed with a pair of fit wings, which ensure that they stay nicely in the ears. The charging case is stunning. It’s built out of stainless steel, and features an ultra-minimalistic design — which we absolutely love. On the front, you’ll get three lights for indicating charge for each earbud and the charging case itself, while the back features a USB-C port. The only issue we would note with the case is that it easily shows fingerprints — but we think the nice stainless steel is still worth having. The switch from MicroUSB to USB-C may seem small, but it’s actually very nice. The world is moving to USB-C, and there’s no point in companies releasing new products with the outdated standard — except to save a few cents on the connector. Master & Dynamic recognized this with the MW50 headphones, and continues that with the MW07 headphones. The Master & Dynamic MW07 headphones are designed with both beauty and function in mind. That’s no surprise from the company, but still worth mentioning — these headphones look great, feel premium, and seem relatively strong too. True wireless headphones often are either comfortable but fall out a lot, or stay firmly in the ear but are uncomfortable. The Master & Dynamic MW07 headphones, however, are some of the only true wireless headphones we’ve seen to buck this trend. That’s thanks to a few different things. For starters, the arm that extends into your ear isn’t overly big, so as to cause discomfort, and the fit wings, which use rubber to keep the headphones in place, even when you move the headphones around. It’s really an ingenious technique — and means that the Master & Dynamic MW07 headphones, without the need for an ear hook or something like that, are some of the best true wireless headphones to get if you want a comfortable, secure fit. Master & Dynamic has a good track record when it comes to sound-quality — and the Master & Dynamic MW07 headphones are no exception to that rule. In fact, these are easily some of the best-sounding true wireless headphones on the market. Let’s start with the bass, which is punchy and strong. The kick drum in AC/DC’s Back in Black, which isn’t usually ultra powerful, nicely cuts through a mix here, while more bass-heavy songs like Eminem’s Forgot About Dre offering plenty of oomph without going over the top with the low frequencies. The mid range is well-tuned, but definitely tuned. The low mids are warm and thick, though they don’t generally get too muddy, which is good. There’s a small dip in some of the high mids, which helps gives the headphones a cleaner sound, while other frequencies, like where a snare drum might sit, seem to have a slight boost. In some songs, we found that vocals seemed a little more laid-back than in others, but it was never a detriment to the overall listening experience. The high frequencies here are clear and detailed, which is always good news. We found that the headphones had nice extension in the high-end, meaning that cymbals had a nice shimmer on them and vocal sibilance was perfectly well-placed. True wireless headphones often have a tough time in the performance department. They range in batter life from around 3 hours to around 5, though the Master & Dynamic MW07 headphones seem to be on the low-end of that scale, coming in at 3.5 hours on a charge. While a little short, thankfully the charging case gives the headphones 1.5 hours of listening time after 45 minutes of charging, and the case will give the headphones an additional three charges. The headphones connect through Bluetooth 4.2, and as such they’ll get a listening range of around 10 meters, or 33 feet. We never experienced any skips or jumps without obstacles or at a further distance, which was helpful. If, however, you do want to save a little money, there are other options you could go for. The JLab Audio Epic Air headphones are half the price and stay in your ears through ear hooks — and while they don’t sound as good, aren’t as stylish, and aren’t quite as comfortable, they do have a better battery life. Still, despite the price and battery life, these are the best true wireless headphones you can currently buy — and because of their great sound quality and high level of comfort, we’ve awarded the headphones the Headphone Review Silver Medal.